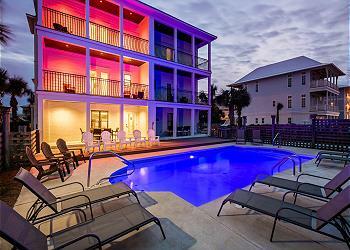 DETAILS: Spend your next beach getaway enjoying the outdoors when you stay at "Four Palms" in Seagrove Beach. This professionally decorated 5 bedroom / 4 bathroom lake front home accommodates 15 guests. This home is comprised of 3 king bedrooms, a bedroom with two twins and a bunkroom! Four Palms has a little something for everyone: swim in the private pool, explore Seagrove Beach on the 5 bikes or take in the beauty of Eastern Lake as you paddle along in the 2 provided kayaks; get your Florida tan on with just a short walk to the beach or head to the nearby restaurants and shops! If that isn’t enough, grab your fishing poles and reel in the fish directly from the backyard. 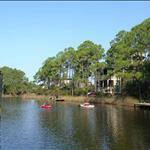 AMENITIES INCLUDE: 4 adult bikes provided, private pool, 2 kayaks. This property comes with 4 dedicated parking spots. Complete Clean Linen Participant - ALL linens, including comforters laundered upon every checkout. This house is beautiful and does not disappoint in any way. We will definitely return here! We are so glad that you enjoyed your vacation with us in Seagrove! Thank you for choosing 360 Blue, we hope to host your next vacation very soon! Everyone enjoyed our stay at "Four Palms". We had plenty of room and places to "chill" apart from each other when needing to. The pool was definitely a main factor in making our decision when selecting this property and it was enjoyed by each member of our family. Glad we had a golf cart for the week; making trips to the beach a breeze. The kitchen was "our" Chef's delight! I gave four stars for Property Category because of cleanliness; better attention to areas around grill and pool area would have gotten a fifth star. All in all great service and super property. We will be back! 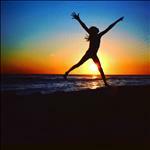 We are so delighted that you enjoyed your vacation with us in Seagrove! 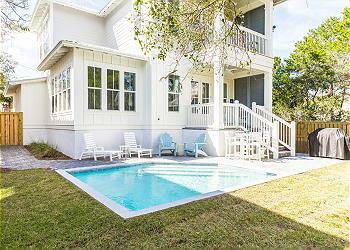 We agree that this home is wonderfully accommodating for everyone and having the private pool is definitely a bonus! The photo you shared is adorable! We will be sure to share your valuable feedback with our team regarding the outdoor area and we hope to see you again soon! We absolutely loved the house, pool and the lake. Location for our group in particular was not ideal but that’s only because we tend to take a lot of gear to the beach. However we never had a problem parking our golf cart near the beach access. We loved the fact that we could set up at the beach with the dune lake right behind us. That was perfect for the little kids when the surf was a little too rough. The only negative I would say was the property management company didn’t deliver our paper goods we ordered in advance to the house and we had to spend time trying to track it down. We arrived early and they let us hang out in the pool until the house was ready so they didn’t come to the back and clean. That’s was probably because we were there. However there was broken glass from some lights under the gazebo that they said would come clean up with a vacuum but they never returned. Again, not really a big deal but was a little disappointed in the property management company. Overall beautiful house!!!! We are so glad you enjoyed the home while on vacation! We apologize for the issues you experienced during your stay. We have recently changed our protocol on package delivery so that this does not happen to our guests any longer. We are also very sorry we were not able to get someone out to address the broken glass and we will be sharing this valuable feedback with our team. We hope you are able to return to the beach again soon! we had 11 family members with us and absolutely loved the house. It is decorated like a model home but still very comfortable. there was more than enough room for everyone. we particularly loved the commercial size ice machine. it made filling the coolers so easy. we rented a golf cart for the drive back and forth to the beach which I highly recommend. the pool is gorgeous but it was way to warm to enjoy. there were also pine needles all over the pool deck when we got there which then kept getting in the pool. we tried to find a broom to sweep the pool deck but there was not one anywhere so we just had to pick them up which took a long time. I recommend you keep a broom available since there is a huge pine tree over the pool deck and it showered needles down every day. despite this we loved the house and would recommend it to anyone. We are so pleased that you enjoyed your vacation! The photo you shared is breathtaking! We apologize for the number of pine needles on the pool deck and lack of broom. We are always just a phone call away for any issues and we would be more than happy to bring out a broom as well as having someone clean off the deck for you. We will share your valuable feedback with our team. We hope to see you again soon! We had a wonderful time bringing our extended family down for fall break. Beautiful house! I brought a group of seniors back in May and was excited to bring my family down for a week. Thank you! We love it when a guest finds a home that they return to again and again. 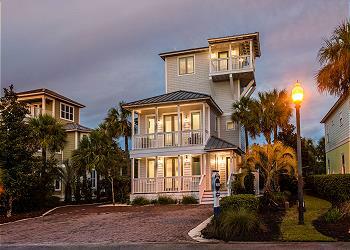 This beautiful home is the perfect place for any beach getaway. We hope to see you back again soon! Great, we stayed at the same house last year and liked it. This year the pool addition made us love it! Looks like it was a super fun day at the beach! We are so happy you had such a wonderful time in Seagrove! Thank you for choosing 360 Blue and we hope to have you back again soon! We have a great time bringing our senior class to the beach! Thank you for letting us stay in your beautiful home. We are thrilled you and your senior class had such a wonderful time in Seagrove! Thank you so much for choosing to stay with 360 Blue and we can't wait to have you back at the beach again soon! What an amazing house! I love that the parents all had king size beds. We shared this house with three families. It accommodated us perfectly. The pool area is like a resort. We all enjoyed the lake and the kayaks to use. The beds were some of the most comfortable I've slept in. The house had everything you could possible need. We will be back!! Thank you so much for staying with 360 Blue! We are so excited you and your party had such a wonderful stay! Those king size beds are always so nice to have, especially on vacation! We can't wait to have you back again soon! 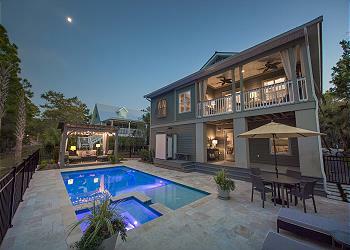 Six ladies shared this beautiful home for a girlfriend trip to 30-A. It was the perfect set up for us to have plenty of space to sleep and the large living room and kitchen to socialize. We enjoyed coffee every morning on the deck overlooking the canal and spend the day on the beach. The water was crystal clear and just as beautiful as the Caribbean. One thing we loved was the flat board walk at the beach with no stairs to climb carrying coolers, chairs, etc. At night we enjoyed Caliza's at Aly's Beach, Acme Ice House and mainly just staying at the house and cooking. The kitchen is a cook's dream!!! And speaking of dreaming, the beds are the most comfortable I've ever slept on away from home. We are having a great time celebrating Father's Day weekend/week with family! We love 30A! 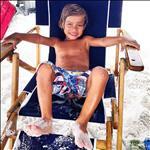 Hi Lawson Family: Thank you for sharing your beach vacation with us! We hope the Fathers in the group had a relaxing time! We hope to see you again next year! The picture sums up how we felt about our stay at 499 Lakeview. There was so much joy shared from coffee in the morning on the porch to days spent on the sand to evenings shared in the kitchen. This house was just amazing. It is beautiful and warm. Every detail seemed so planned out for families. We enjoyed the kayaks, bikes, porch swing, THE KITCHEN! 499 Lakeview is in the perfect location on Eastern Lake, close to the beach and close to shopping and restaurants. 360 Blue is a great company with amazing customer service. I am so glad I chose this company for our family vacation. 499 Lakeview was such a blessing to our family and we hope to come back and make new memories every year! Who can look at that picture and not smile? We love to hear about great trips like you all had! We have been to this area many times. This is by far the bes vacation ever. The house is impeccable. Every detail shows the great taste of th owner. Too many thing to do- kayaking in th lak, bicycling, fishing just to mention a few. The walk to the beach is very short. We had so much fun!!! Thanks again to the owner and 360 Blue! It is so good to hear you had a blast out on the lake! This home and community are both so great for the whole family. Thank you so much for sharing and for staying with 360 Blue! That picture is so beautiful! Bring the kids back soon for more memorable beach days! Thank you!! What a great experience! Our family really enjoyed our stay on Lakeview. It was the perfect location to enjoy Eastern Lake and the beach. We spent our days paddling the lake and spending hours on the beach. We were a little concerned that the home did not have a pool, but when you are on the lake you don't need a pool! The home is beautifully decorated and very comfortable! We will absolutely be returning! Also the concierge services were awesome. We did a family bonfire that was amazing. Had our beach chairs set up with the beach service everyday - this made our vacation so relaxing. Not having to carry chairs back and forth to the beach was a game changer. Also the bikes, SUP Boards and Kayaks were a must, we loved them! Sounds like all the ingredients to a perfect family vacation! 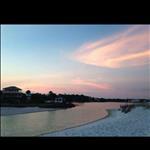 Thank you so much for sharing and for staying with us in Seagrove! We're happy you enjoyed this home and its location as it is certainly ideal for everyone! Give our concierge a call when you're ready to begin planning your next trip! Thank you!